It's always hard to remember if you're supposed to put the flavor crystals in before you add the carbonation or after. Thankfully, this band actually has nothing to do with the poorly FDA inspected confectionery of your youth. While they may share a name, that's just about where the similarities end. 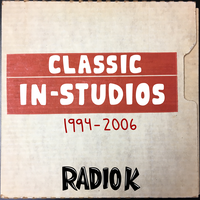 This version of "Antenna House" was recorded right here at Radio K making it extra special and #rare. Put it on, stretch your legs, and relax. After you've gotten comfortable, check out the rest of their live session Flavor Crystals did with us by heading over to our in-studios page. You'll be glad ya did!